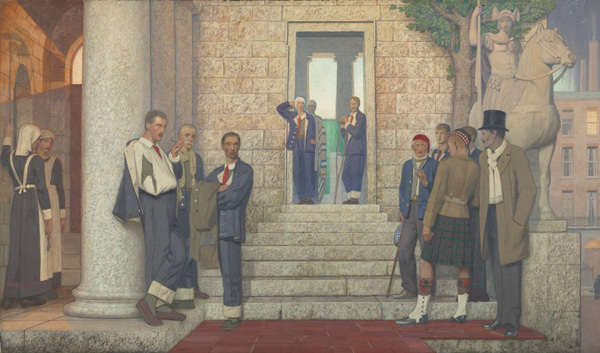 Since the Wellcome Trust purchased Frederick Cayley Robinson’s Acts of Mercy in 2009, the four paintings have been moved around a considerable number of times. This wouldn’t be an issue if they were a reasonable size, but as anyone who is familiar with them knows, they are pretty huge (1.96m x 3.36m). Two of the paintings were transported to new UCLH Cancer Centre in Huntley Street, where they are currently on display. The most recent move has been driven by the upcoming redevelopment of the Library. Once work starts in earnest at the beginning of August, there is a risk that the paintings, which until last week were on display in the Library entrance hall, could be damaged by dust and vibrations so the decision was made to move them into the safety of our stores now. 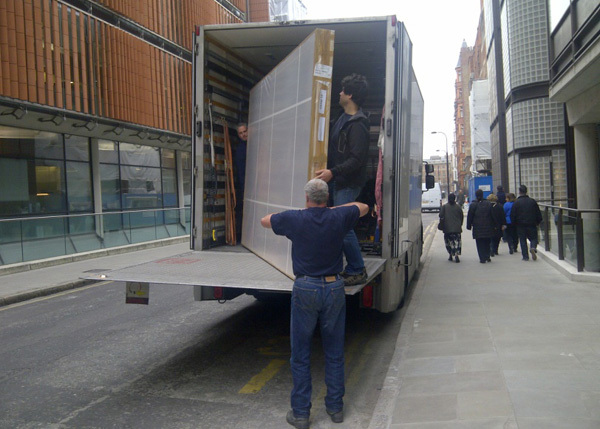 We wouldn’t dream of attempting a move like this without specialist help, so the art handlers Momart were hired to do the job for us. All work had to be completed before the building opened to the public at 10am so a very early start was arranged. 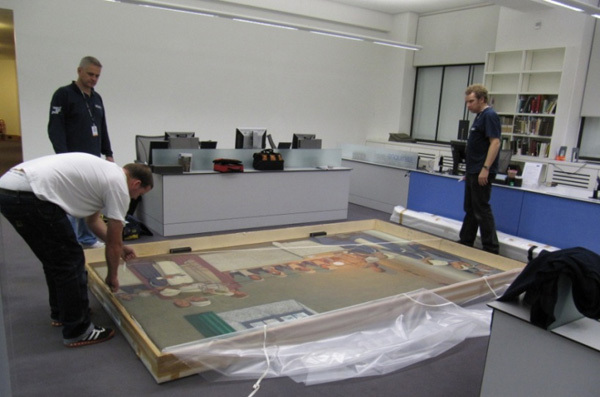 One of the paintings being placed in its protective travel frame. Because the Wellcome building doesn’t have a lift big enough to fit the paintings, they had to be carried up the main stairwell from the Library on the 2nd floor, to the stores on the 4th floor – not a job for the faint hearted! The paintings were placed in protective travel frames before movement, so this added to their bulk and weight. It took 6 technicians, and lot of strength and stamina, to carry each one safely up the stairs. Thankfully it all went without a hitch and the paintings are now in the cool and calm sanctuary of our stores and will remain there until the building work is complete.